GCSLS 2019 was a historic summit, sponsored by eight Christian school associations, that worked to bring nearly 1,100 attendees from 25 countries, and over 75 presenters together—for two and half days of dialogue, collaboration, networking, and encouragement. 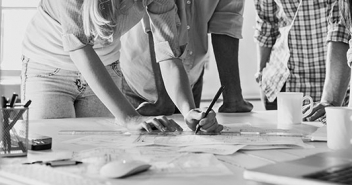 Research has shown that innovation rarely happens in a vacuum. In the vast majority of instances, curious people, who had problems to solve or were looking for new opportunities, found others who were innovating. And the friction between them sparked their imagination and a desire to take risks. There’s even research that suggests that the only way innovation spreads in an industry or a field is through cross-collaboration, across different sites, networks, and people. “Imagine that you have an identical twin, endowed with the same brains and natural talents that you have. You’re both given one week to come up with a creative new business-venture idea. During that week, you come up with ideas alone in your room. “In contrast, your twin (#1) talks with 10 people—including an engineer, a musician, a stay-at-home dad, and a designer—about the venture, (#2) visits three innovative start-ups to observe what they do, (#3) samples five ‘new to the market’ products, (#4) shows a prototype he’s built to five people, and (#5) asks the questions ‘What if I tried this?’ and ‘Why do you do that?’ at least 10 times each day during these networking, observing, and experimenting activities. Who do you bet will come up with the more innovative (and doable) idea? But it’s important to note that friction, and sparks, are not always comfortable things. In fact, friction and sparks generally produce fire—and fire can be a good, life-giving thing, but it’s also risky. Starting a fire has a certain degree of risk that comes along with it. And many of us may be uncomfortable with risk, and schools are often resistant to change. But it’s an illusion for us to think that every other field or industry on the planet has gone through revolutionary changes—from medicine, to manufacturing, from communications, to transportation—that every other field, every other industry, is in what Rex Miller calls a state of “perpetual beta”—but that somehow education will be exempted. Between societal changes, market changes, changes in learners’ needs, generational changes in leadership styles, and proliferation of new educational delivery models, education in most countries is under pressure to do far more with less, regardless of sector—whether private Christian schools, to independent schools of all stripes, to public or government schools. We need to become comfortable with being uncomfortable. We need to learn how to take risks again, to jump off cliffs and trust in the One who created us in His creative image. The definition of insanity is “doing the same thing over and over, and expecting different results.” I would say that innovating is the only sane way to be, in the face of the challenges and opportunities that are here, and that lie ahead. We’d be insane to not embrace innovation. At the same time, when we asked the question on the pre-summit survey, “In general, would you describe Christian schools as innovative,” 75 percent of respondents said no. Rather than be discouraged by this, I’m actually encouraged—because if we think we’re in need of innovation in Christian education, then we came to the right place, at the right time. Providing an authentically Christian education that leads to genuine learning and spiritual formation. I think this can definitely be seen as an “issue,” but I think more than that, it’s actually a good description of our mission. What’s encouraging about this is an authentic Christian education, which results in truly deep learning and in students’ developing spiritually, is still what’s most important to us. It’s what gets us up in the morning. It’s the moral “why” for what we do. It reminds us that we have a “north star” when we think about innovation. We have what Dr. Beth Green, a GCSLS keynoter, has called a goal, a purpose, a telos for innovation. In fact our goal in innovating ought to be to provide an education that is more authentically Christian, that better engages students in their learning, and that helps students to move, more deeply into a connection and relationship with God, and actively participate in Jesus’ redemptive work. We innovate when we work in dependence on God, and in partnership with each other, to move closer to these goals. Equipping students, and schools, to engage the larger culture in meaningful, impactful, and redemptive ways. It is also encouraging that this issue falls only second to the first. With over 25 countries represented by GCSLS attendees, our political, cultural, and societal contexts certainly differ across the world, but our mission as believers does not—to engage in the Great Commission, and to fulfill the Greatest Commandment. We are called to share the good news of the gospel, while loving God with everything we have, and loving our neighbor as ourselves. And to answer any objection we might have to being, as James Davidson Hunter would call it, “faithfully present” in the lives of our neighbors, Jesus even gives us the parable of the Good Samaritan, to make it clear that yes, even our enemies qualify as our neighbors. Everyone created in the image of God is our neighbor, endowed with intrinsic worth, dignity, and value to God, and therefore, to us. But to have a neighbor, generally speaking, requires us to live in a neighborhood. And we can call our neighborhood, broadly speaking, the “larger culture.” So the question is, how can Christian education be a winsome neighbor to the larger culture? We need to think in innovative and non-isolationist ways if we want to be a loving neighbor in an interconnected world, and with governments and media that in most places across the globe are either hostile, or growing increasingly hostile, toward religion in general, and Christianity specifically. In fact, for those of us here in the U.S., it has been a challenging few weeks in terms of media and social media coverage of Christian education. Much of the coverage has been disparaging, and has included direct attacks against specific Christian schools, against the backdrop of an already hyper-charged political environment, fueled by a 24-hour news cycle and social media. We know from colleagues across the world that these events have been widely reported internationally as well. Fundamentally, at issue is the right of Christian schools to offer an education based on the historic, orthodox faith shared by hundreds of millions around the world, to employ people whose beliefs and values are consistent with theirs, and for parents to have the right to decide what kind of education they want for their children, including faith-based schools. Also at issue is the mischaracterization of the aims of Christian education by the larger culture. Certainly, in a fallen world, no school or educator is perfect, every institution’s history is checkered and must be acknowledged, and today’s Christian schools can and must improve. But entirely missing from the larger discourse is the narrative of that to which Christian education aspires, namely, to embody and teach our belief that there is hope, for this life and the next; that we believe every person has intrinsic worth, regardless of their background; that Christian schools exist to help make the world a better place by preparing good citizens of tomorrow, who serve others in Jesus’ name; and that in interacting with others, Christians seek to emulate Jesus’ example of grace and truth, with simultaneous generosity of heart, and certainty of conviction. In this season, those of us in the U.S. have been grateful to our brothers and sisters from around the world, for their godly example, and also for their encouragement, to first consider Jesus, who endured such hostility (Hebrews 12:3), and from Colossians 4:5–6, to “Walk in wisdom toward outsiders, making the best use of the time. Let your speech always be gracious, seasoned with salt, so that you may know how you ought to answer each person” (ESV). 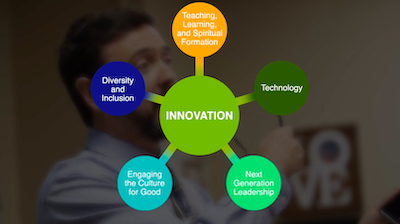 When we set this priority, “Equipping students, and schools, to engage the larger culture in meaningful, impactful, and redemptive ways,” we acknowledge that Christian education is deeply in need of innovation—meaning generative thinking and action—in these Colossians 4 areas: in walking in wisdom, in good use of our time, in gracious speech, and in having knowledge of how to respond to the culture—with the goal of engaging in Jesus’ loving and redemptive work in our neighborhoods. To do this, we need to spend time with colleagues from around the world, with whom we can share, dialogue, and pray to these ends. In closing, I want to address what I think is the biggest obstacle to innovation, and therefore to God’s provision for the mission of Christian education to be fulfilled into the next generation. As is the case so many times, what stands in our way with God’s good will and purpose is our own fear—and we need to not only overcome that fear, but also replace it with joy. Here are five fears can we reframe in terms of joy. 1. First, our fear that our survival is in our own hands, to joy that our God will meet all our needs, according to the riches of His glory in Christ Jesus. If it’s insane for us to think that what our work looks like in Christian education will never change over time, it’s also equally insane for us to think that the God who created the universe, who set the planets in motion, and who has provided for our salvation through His Son’s death and resurrection, will not provide everything we need as we work to accomplish His mission. 2. Second, we need to reframe our fear of losing our historical institutions, or the way we’ve always done things, or our four-walled schools as we have always known them—to joy at the new opportunities that God will open up, as He continues to advance the mission of Christian education: that authentic education that leads to genuine learning and spiritual formation—no matter how that is delivered, and no matter how different it looks in the future. 4. Fourth, we need to exchange our fear of uncertainty, of not knowing exactly what to do, of not having that one “best practice” that we know for sure works—for the joy that comes with allowing God to awaken our imagination. We’re made in His image and have been endowed with potential for creativity, problem-solving, and continuous improvement, and along with that should come a sense of confident hope and even expectant exhilaration. 5. And perhaps most importantly, we absolutely must let go of our fear of taking risks, and instead find joy at what God will do—what He always does—which He describes in Isaiah 43:19: “See, I am doing a new thing! Now it springs up; do you not perceive it? I am making a way in the wilderness and streams in the wasteland” (NIV). Let’s be encouraged to see and perceive what God is doing—in the words of Isaiah, the new “ways” He will open up for Christian education, and the new streams He will cause to flow through us, if we will only see and perceive it. [Editor’s Note: This post was adapted from the opening remarks delivered at GCSLS 2019, on January 30 in San Antonio, Texas. To view 20 sessions from GCSLS 2019 anytime between March 1 and August 31, 2019, register for the 2019 eSummit here]. Dr. Lynn Swaner is the chief strategy and innovation officer at ACSI, where she develops strategies and leads initiatives to address compelling questions and challenges facing Christian education. Prior to joining ACSI she served as a Christian school administrator and a graduate professor of education. A published scholar and conference speaker, she is the lead editor of the book PIVOT: New Directions for Christian Education, co-author of Bring It to Life: Christian Education and the Transformative Power of Service-Learning, editor of the ACSI blog, and podcaster for ACSI’s Moving Forward podcast. She received her EdD from Teachers College, Columbia University, in New York City. She can be reached via email at lynn_swaner@acsi.org.